India is the incomparable land that enthrals every tourist with its diversity. There are several tourist attractions in India that attract innumerable tourists every year. Most of the travel destinations in India are connected by air. Flights to India a make the fastest means of commuting. 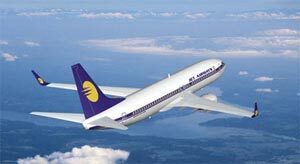 Wish to book your tickets for India Flights? We as a leading travel agent for India offer travel services to make your travel to India comfortable. Just let us know your detailed requirements and we will offer you the best deal on the flights to India. As per your budget you may opt for cheap flights. Arrangements can also be made for charter flights to India. For any travel destination in India we can book flight tickets. People who want to fly in privacy and want to indulge in luxury can avail charter flights to india.You can book air tickets for cheap flights, charter flights and regular flights in advance to avoid the peak season rush and to avail the discount on the air ticketsWhat vibrant, exotic images are conjured up when you think of India? Snake charmers and saffron clad pandits reading your fortune by the sacred River Ganges?' Poverty-stricken orphans running after you for small foreign currency? Well think again. India has progressed and developed in leaps and bounds over the last decade or so and is now considered a serious world economic force to be reckoned with. International powerhouses such as Microsoft, Hewlett Packard, British Telecom, British Airways and major brands such as Louis Vuitton, Chanel, Swarovski, Hugo Boss and Tommy Hilfiger have recognized and acknowledged this growing need and have promptly set up shop in India, having recognized the huge spending potential of the upper middle classes here. Of course, you still see the occasional decorated elephants passing by in majestic street wedding processions but did you know that weddings in India cost more than an average European's annual income? With a population of 1 billion and American style super-malls and multiplexes opening on every street corner, it would be easy for India to lose its identity...but this has not happened. Indian hospitality still exudes the unmatched charm, warmth, friendliness and sincerity of yesteryear and the authenticity and simplicity is what appeals to so many foreigners visiting India. Your visit to India is incomplete without making a trip to the awesome, marbled beauty of Agra's Taj Mahal, one of the most jaw-dropping, ostentatious symbols of a husband's eternal love for his wife. Yet this 17th century monument remains one the most visited sites in the world, ranking amongst one of the Seven Wonders of the World. International celebrities from Princess Diana to President Clinton have all paid homage to Emperor Shah Jahan's epic monument and there is nothing more romantic nor inspiring than visiting the Taj Mahal in the evening and seeing the spectacular architecture by moonlight. India is truly a tourist paradise. From the white sandy beaches of Goa to the Ayurvedic spas of Kerala; from the snowy white peaks of the Himalayas to the green, lush, sugar-cane fields of Punjab, the sights, smells and sounds of this mysterious, exotic land will entice you and tempt you to re-visit again and again! The major points to enter in India are Mumbai, New Delhi, Bangalore, Chennai, Kolkata and Hyderabad. When you come from western countries, chances are that you will get in through these cities. In the recent years, many other airports have been upgraded to manage the international flights. So book cheap flights to India online with Tickets To India and receive special discounts on cheap flights to India. Enroll yourself with our regular newsletters to update you on any promotional offers on ?buy one get one free? and other money saving ideas!